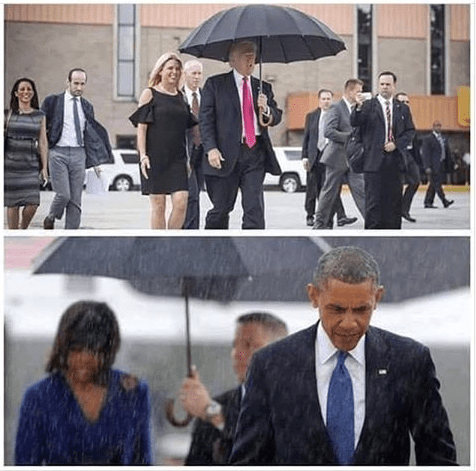 What is the difference in character from these pictures? Larry Summers wrote a post yesterday about the hollowing out of the middle class and how that has lowered consumption and led to secular stagnation. He says that this effect must be taken into account for policy. Larry Summers sees new research, but I have seen 4 years of economists not understanding effective demand. So when I see Larry Summers’ post, I again see how far behind economics is in truly understanding the dynamics of effective demand. He notices a connection between labor income and economic potential, but has no model to define it yet. I have a models of effective demand that work and that can be built upon. From my models, the effects and limits of effective demand are definable and forecastable in terms of labor and capital utilization and more such as interest rate policy. My models show that the effect on natural real rates from a drop in effective demand can be measured. Larry Summers has not said it yet, but corporate after-tax profit rates will have to drop. 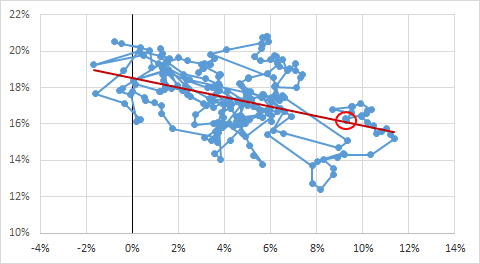 Also, my models show that the Fed missed a whole interest rate cycle and they do not even know it yet. They still think the cycle is just beginning. That shows how much an understanding of effective demand is lacking. It is a serious issue. Larry Summers does not have precise models yet for effective demand, but he has opened the door to knowing. 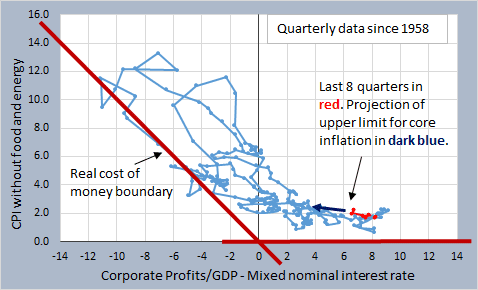 The graph implies that as profit rates come easier over the nominal cost of money the percentage of gross private investment to GDP tends downward. I tweeted this graph to Miles Kimball who is in favor of negative nominal rates. Negative rates would tend to move the data points to the right implying weaker investment. He replied that the x-axis has too much inflation in it. He suggested that inflation be added back into the x-axis. So I added core inflation into the x-axis and got this. Same data here but showing trend line and patterns connecting points. Still a downward trend is apparent. 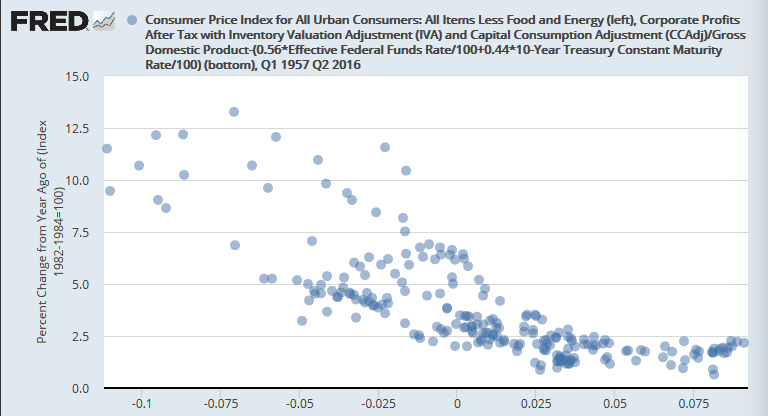 So even adding in core inflation to the x-axis did not dismiss the pattern. 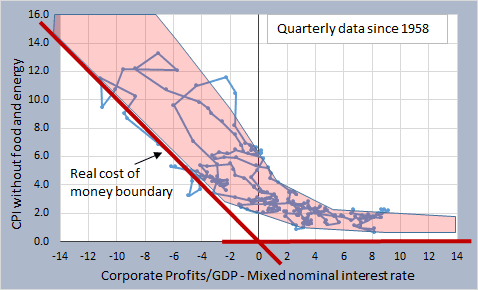 This graph would be a problem for those who call for negative nominal rates in face of high after-tax profit rates. The graph implies that investment may not pick up at all. The red circle marking 2016 data shows that the price of using and getting money is very low by historical standards. Why invest when your returns come so easily? Why invest when creative destruction is weak because weak companies are given a life line with low nominal rates? UPDATE: Just want to add a graph that shows the % of data points within a certain distance vertically from the trend line in the 3rd graph above. This graph implies that it is less likely to be farther away from the trend line. 50% are within plus or minus 1% from the trend line. 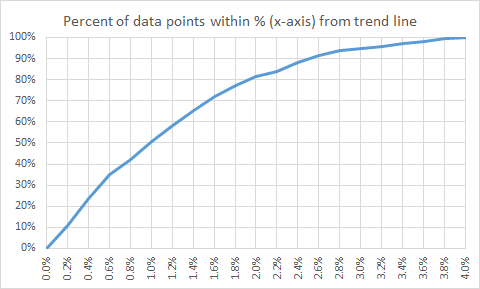 10% of the data points are farther away than 2.5% from the trend line. Red circle is 2nd quarter 2016. I have posted this model of core inflation before. Core inflation on y-axis. 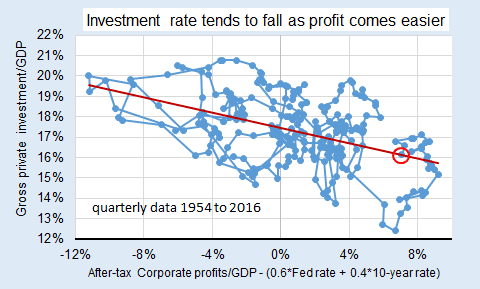 Corporate-after-tax profit rate minus nominal rates on x-axis. 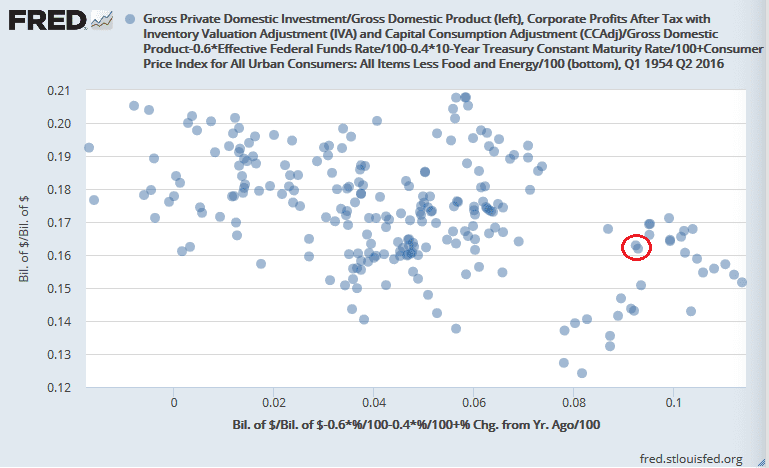 The model implies that inflation depends upon the difference between an aggregate corporate profit rate and nominal rates. The more nominal rates cut into corporate profit rates, the more corporations would choose to raise prices to maintain “net” profit rates… and thus create inflation. Olivier Blanchard and Adam Posen wrote last December in 2015 an article titled, Japan’s Solution Is to Raise Wages by 10 Percent. As wages rise, corporate profit rates come down. So if you want to cut into corporate profit rates but cannot do it by raising nominal rates, then do it by raising wages. Either way, the data points move left on the x-axis making inflation increases more likely. 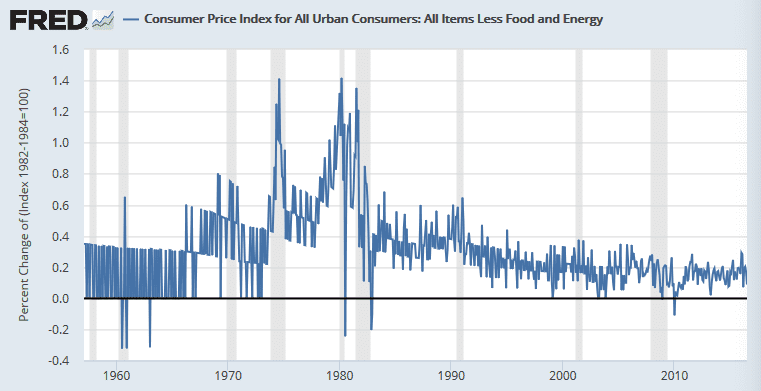 There used to be ranges that core inflation moved within. The monthly change either hit the maximum of that range or the minimum with some breakout movements in between. Monthly movements made sense by looking at 12-month moving averages. Since about the year 2000, the visible ranges have disappeared. The monthly movements are more free-form. 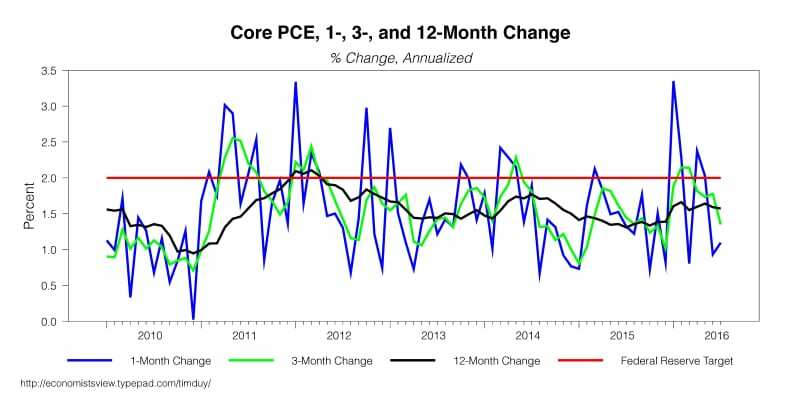 Thus monthly core inflation numbers should be more accurate now. However, there is still noise in the movements which belie that prices are sticky and should not change so erratically. The best way to view monthly inflation numbers is with “Annualized” moving averages as Tim Duy does. Here is an example from Tim Duy. Look at the time period from mid-2010 to mid-2011. You see large positive monthly movements in the second half of 2010 but the 12-month moving average was rising much more slowly. In the first half of 2011, inflation was coming down, but the 12-month moving average was still rising and kept rising until mid-2011. So the noisy monthly movements were designed to keep the 12-month moving average on a steadily rising trend. Discerning the correct and steady trend of core inflation is the key. Back in the early 80’s, my undergrad teacher would use an 18-month moving average. But if we knew which monthly moving average is being manipulated on a monthly basis, we would understand each monthly change better. At a time in history when inequality is growing and immigrants are being shunned, I offer the story of Pedro Opeka… He is an Argentinian priest working in Madagascar. I have posted this graph before. Here is updated data. 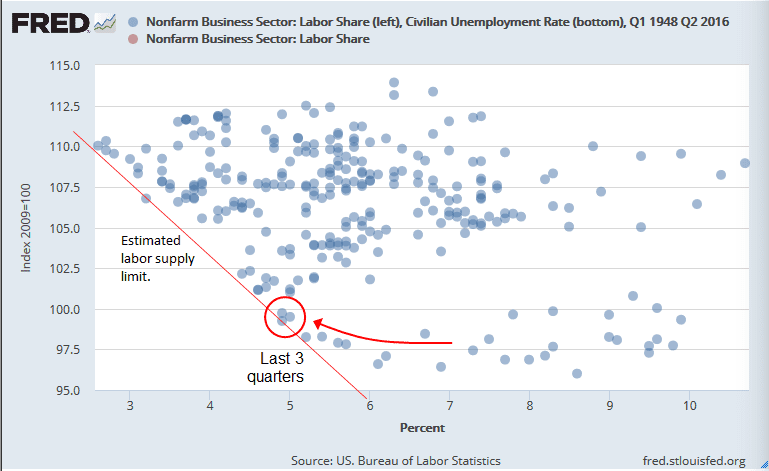 The data points suggest a labor supply limit shown by the down-sloping red line. As labor share drops, unemployment tends to bottom out at higher levels. The last 3 quarters are circled. Recent data is rising up the supply limit line. If the limit holds, further declines in quarterly unemployment will call for more labor share. Why would anyone still talk about a Phillip’s Curve? Who in their right mind would still talk about the Phillip’s curve after seeing this comparison? The Phillip’s curve is obsolete. 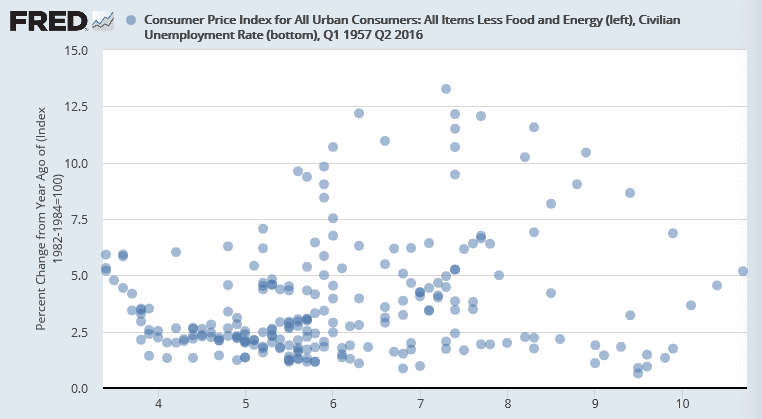 Inflation does not reliably depend on employment. So what other model could we depend on? Here we have quarterly data since 1958. That is 234 data points! Inflation has stayed within the range filled in with red for all those years. In this graph, we see the last 8 quarters of data highlighted in red. Corporate profit rates have fallen some. The mixed nominal has actually dropped a bit too, but corp. profits rates have dropped more. 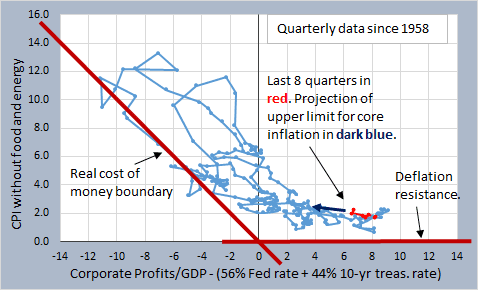 The dark blue arrow marks the predicted upper limit of core inflation according to the pattern set up in the model. So the model predicts that core inflation will ride along or under this upper limit of around 2.2% as the data points move left on the graph. 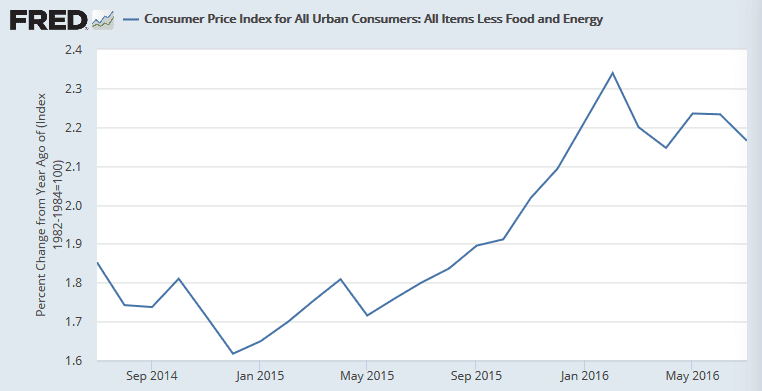 Does core inflation show signs of moving along the upper limit? Core inflation rose to around 2.2% and looks to have stabilized at the upper limit in the model above. I predict that core inflation will continue to follow closely to the projected upper limit.